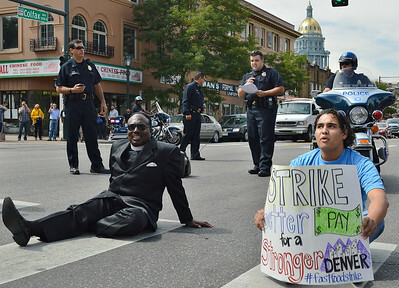 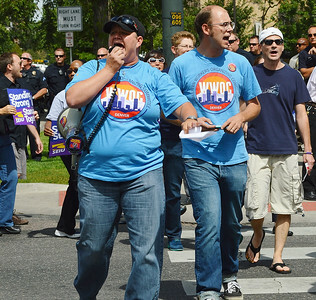 Fast food workers in Denver rallied then marched to a nearby McDonalds restaurant where they blocked traffic at a busy intersection. 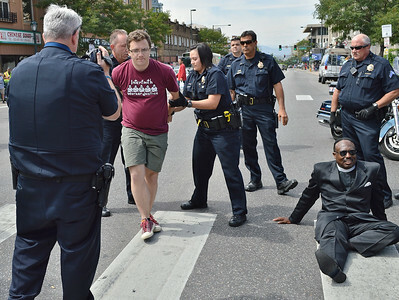 Three demonstrators engaged in non-violent civil disobedience, refusing to move from the street, and were arrested by police. 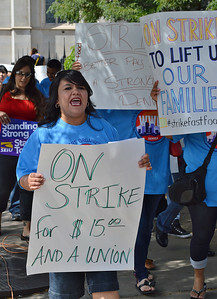 Hispanic woman shouting while holding sign "On Strike For $15 and A Union", other protesters behind her. 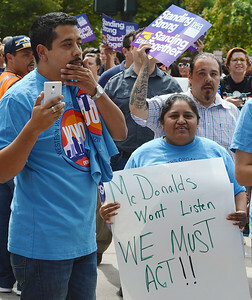 Young woman holding sign at McDonalds protest, other demonstrators with union signs in background. 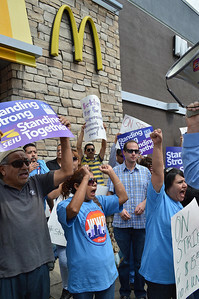 Hispanic man and woman at fast food worker protest, man holding cellphone, other protesters behind them holding union signs. 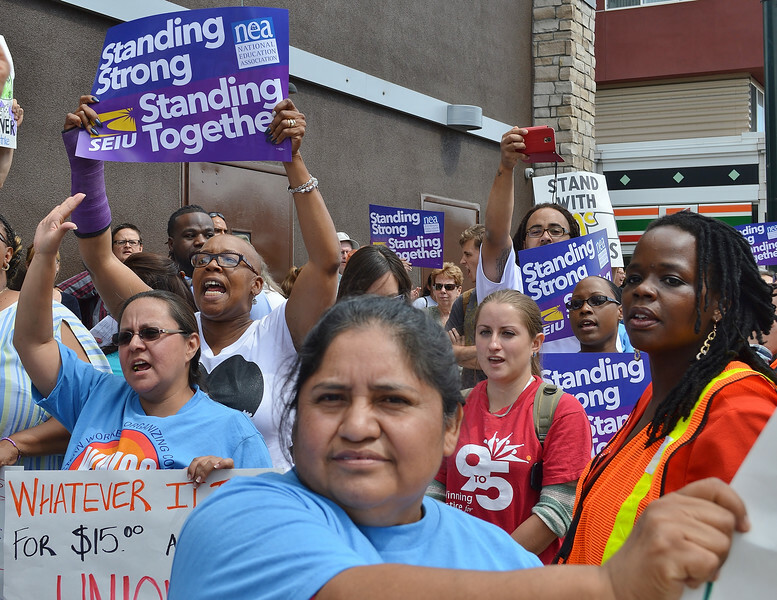 Protesters at fast food workers protest, one speaks through bullhorn, other in background with union signs. 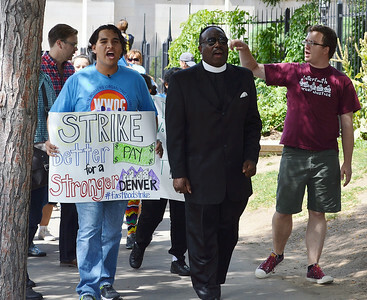 African-American minister marching next to young man carrying sign about striking for better pay, other prot4esters behind them. 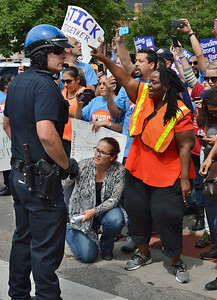 Police officer wearing helmet with microphone, in front of him, group of protesters with signs raise hands in the air. 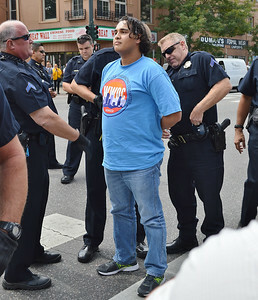 Hispanic man wearing fast food worker t-shirt being handcuffed by police. 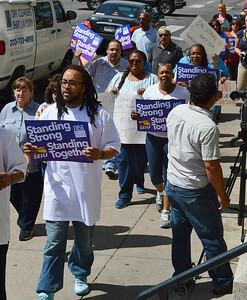 Group of African-American protesters marching down sidewalk carrying union signs. 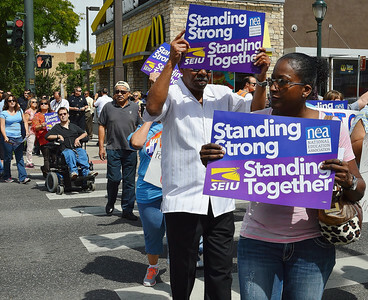 African man and woman holding signs about unions with SEIU and NEA logos on them, in background more protesters including man in wheelchair. 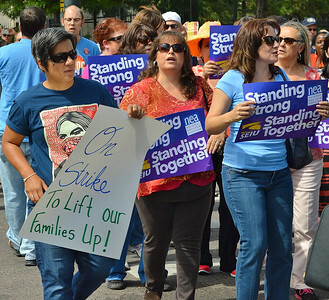 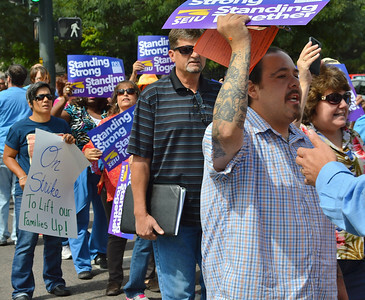 Hispanic man with tatoo on arm raises union sign in the air, other protesters with sign in background. 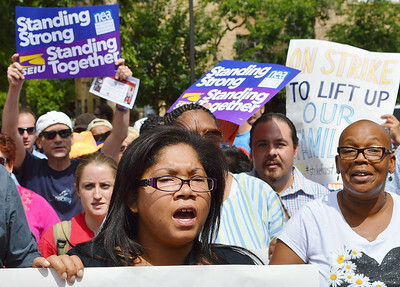 Group of women with union signs, other protesters behind them. 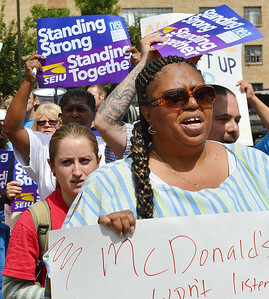 African-American woman holding sign at McDonalds protest, other demonstrators with union signs in background. 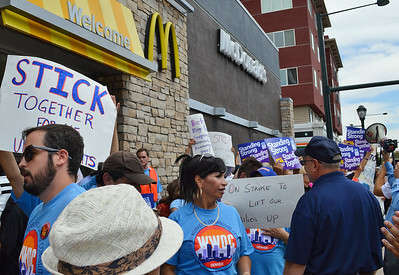 Large group of protesters with union signs in front of McDonalds restaurant. 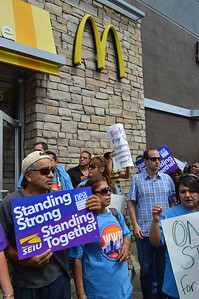 Group of protesters with union signs in front of McDonalds restaurant. 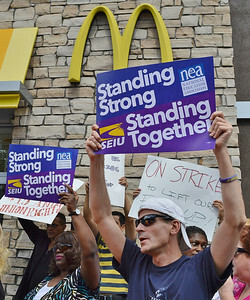 Man raising union sign above his head McDonalds restaurant "Golden Arches" in background. 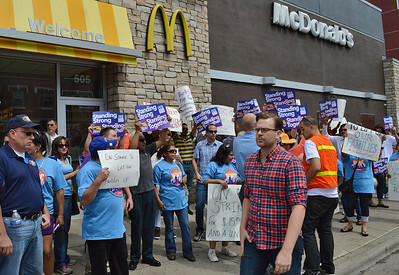 Large group of demonstrators at fast food workers protest holding union signs, one raises cellphone camera in air to take picture. 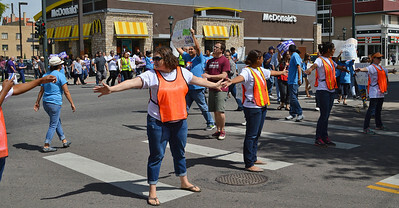 Line of women wearing orange vests, arms stretched out, blocking intersection, protesters with signs marching in background. 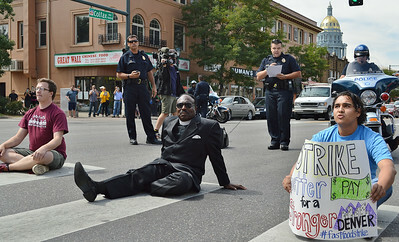 Three protesters sitting in street holding hand, behind them police officer reads statement into microphone. 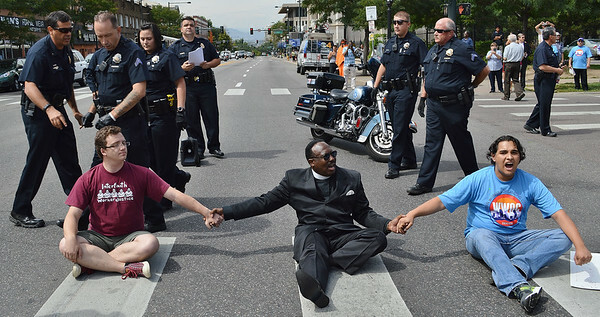 Protester being handcuffed by police officers, other demonstrator sitting on street. 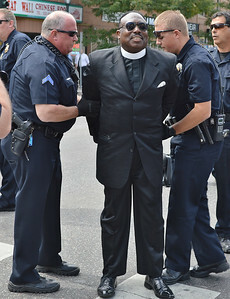 Police officers handcuff African-American minister at fast food workers protest.